We're shooting video here Wednesday night and I need to "dress" the studio. Which means cleaning all of hte junk out of here and decorating it with all of my art work. 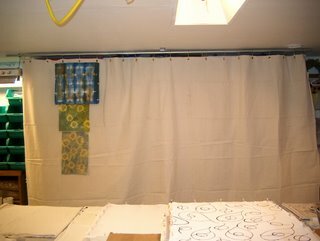 Auditioning fabrics to go on the design wall, art cloth I have created, in addition to getting all of the samples staged - meaning having the samples for each technique done in stages. Here's a pic of my design wall, hiding all of the not so pretty crates, hey you do what you have to do sometimes. The upside is I now have a place to hand my art cloth from.